China is on course for a greater opening-up of its economy, which is increasingly becoming a magnet for foreign investment, senior government officials and business executives said over the weekend at a high-profile forum in Beijing. China's economic development has been achieved through reform and opening-up, and greater opening-up is a must for the economy's future high-quality development, Chinese Vice Premier Han Zheng said on Sunday at the opening ceremony of the annual China Development Forum (CDF) at the Diaoyutai State Guesthouse. 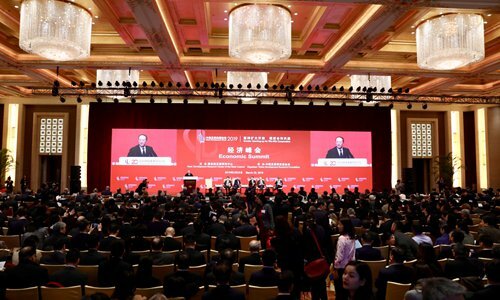 The CDF, hosted by the Development Research Center of the State Council, the cabinet, has gained increasing attention in recent years for its gathering of high-ranking government officials and top industry executives. A confluence of voices pledging greater opening-up at this year's forum put the nation's deregulation efforts in focus. The country will unswervingly boost imports and continue to reduce tariffs, Han said, noting that the push for easing market access for foreign investment will continue, the negative list of investment will be shortened further and wholly owned foreign ventures will be allowed in more sectors, among wide-ranging opening-up efforts. The opening of the country's financial sector seems to have been particularly fast-paced in recent years. "There's apparent progress on foreign-invested financial institutions making inroads into the Chinese market," Yi Gang, governor of the People's Bank of China, the country's central bank, said Sunday at the forum. In a fresh move, Bank of Beijing, one of the country's largest city commercial banks, announced Thursday that a wholly owned subsidiary of Dutch ING Group will set up a joint venture with the bank in which the ING unit will hold a 51 percent stake. If approved, the JV will become the country's first foreign-controlled lender. Yi vowed that China will continue to pursue opening of the financial services sector, giving equal treatment to both Chinese and foreign institutions in areas including shareholding. It's a good time to quicken the pace of financial opening in China, Peter Tyroller, a member of the board of management of Robert Bosch GmbH, told the Global Times on the sidelines of the forum on Sunday. Still, "cautiously considering the risk of opening too fast means being careful while seeing the necessity to open," he said. A new industry catalog to encourage foreign investment will attract multinational companies to invest in China and set up manufacturing and research and development centers in the country, Ning Jizhe, vice chairman of the National Development and Reform Commission, said Sunday at the forum. Foreign direct investment in China hit $135 billion last year, an indication that the country remains one of the most attractive investment destinations worldwide, according to Ning. In another sign, the World Bank Group's annual business environment report, released in late October 2018, showed China advancing to a global ranking of 46 from the previous year's 78, which the World Bank attributed to the country's brisk reform efforts. Speaking on Saturday at the Economic Summit, part of the CDF, Han Wenxiu, executive deputy director of the General Office of the Central Financial and Economic Affairs Commission, said "we advocate making a bigger cake and sharing the cake, and not engaging in a 'zero-sum game'." The crystal-clear opening-up signals apparently provide a boost for foreign investors seeking opportunities in the Chinese market. "The investment environment in China has been increasingly open, and the business environment in China is as well improving. These chances provide multinational companies with vast space for their development in China," Leif Johansson, chairman of AstraZeneca, a British-Swedish pharmaceutical and biologics group, told the Global Times. Johansson also reflected on the newly approved Foreign Investment Law, which was in the spotlight at the forum. China will ramp up efforts to flesh out the newly passed foreign investment law to protect the legitimate rights of foreign-invested businesses, senior government officials pledged at the CDF. In a conspicuous attempt to make the country more appealing to foreign investors, China's top legislature earlier in March approved the new foreign investment law, which will take effect on January 1, 2020. The new law demonstrates the Chinese government's attitude and its determination to further open up the nation's market, Johansson said, stressing the company believes that the investment environment in China will become more open, fair, transparent and predictable. "Therefore, we will further increase our investment in China," he said.